There have been nearly 70 vehicle-related petty thefts and criminal damaging cases in Slavic Village since Jan. 1. 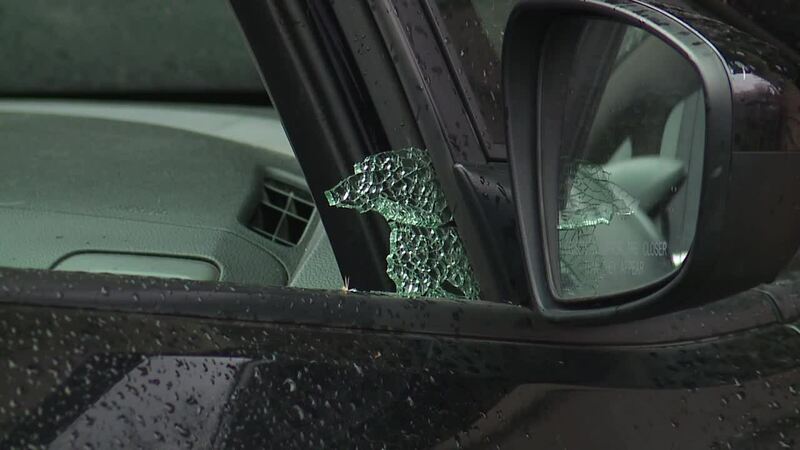 CLEVELAND — Cleveland police responded to at least a half-dozen reported car break-ins overnight in the Slavic Village neighborhood, bringing the total number of vehicle-related petty thefts and criminal damaging cases in the area to 68 since Jan. 1. For the owners of neighborhood mainstay Fleet Bike Shop, the most recent break-in is an aggravating case of déjà vu. Shortly before 7 o’clock Friday morning, surveillance cameras on the shop’s exterior captured a man sauntering down Fleet Avenue before turning onto East 50th Street. The man walks by Margaret Zaleski’s SUV before he pulled out some sort of instrument and shattered the rear passenger window. The man also left large cracks in the front passenger window. Then, the surveillance video shows the male dive head first into the vehicle. Over the next two minutes, he pilfered through Zaleski’s vehicle, snatching cash and loose change. The suspect’s haul was only a couple of dollars, Zaleski said, but he caused hundreds of dollars worth of damage in the process. The break-in of Zaleski’s vehicle was one of at least a half-dozen in the Slavic Village neighborhood overnight. The areas hit by the suspected thief include the Fleet Avenue corridor, as well as East 57th Street and Harvard Avenue. According to CPD’s Crime Analysis Unit, there had been 62 total vehicle-related petty thefts and criminal damaging cases in Slavic Village from Jan. 1 through April 11. Friday’s break-in spree would bring the total to at least 68. Nearly half of those break-ins have occurred since March 1. “These are bold criminals that should be caught and prosecuted to the fullest extent of the law,” said George Ringholz. Ringholz is another vehicle of the break-ins that happened early Friday morning. Friday’s break-in marks the second time Zaleski’s vehicle has had its windows broken and its contents ransacked. The stress and aggravation, she said, reminds her of a brazen burglary three years ago that nearly bankrupted her family’s business that has been in operation for nearly five decades. In that case, a group of individuals broke into the back door before taking cash, tools and dozens of bicycles, including some of the bikes belonging to the business’ customers. Anyone with information regarding the thefts is asked to contact the Cleveland Police Department.